Commonwealth Government’s VET Student Loans scheme allows eligible students to apply for a loan to pay for their fees up to capped amounts. The loan applies to eligible courses at the Diploma level or above. The student will then be required to pay the loan and a loan fee back to the government. The Wisenet VSL Module enables your organisation to collect, store and produce reports as required under your VSL provider registration. Use Email templates to standardise your communication and save time. Prior to creating Course Offers you need to indicate which Courses are for VSL. Adding a Course Offer for VSL follows the same process however, ensure that any additional AVETMISS fields are entered and the Course Offer Name and Code is easily identified as VSL. Units of Study is important for VSL delivery as it allows for groups of Units and Competency. It is important that all the relevant fields in their Profile be completed to avoid errors when reporting. In Wisenet, go to the Learner record and ‘edit personal details’. Click the binoculars icon on the Learner personal details page next to the CHESSN field to open a window into the HEIMS Admin CHESSN web service. Search for the CHESSN or Allocate a new CHESSN. Follow the steps for enrolling a Learner ensuring that all relevant fields for VSL have been completed. Note: The completion status should be set to 3: Successfully completed all the requirements after the entire unit of study has been finalised. RPL for the purposes of the VSL Assistance Scheme, is defined as the acknowledgement of a person’s skills and knowledge acquired through previous training, work or life experience, which may be used to grant status or credit in a VET unit of study. The granting of status or credit by an institution or training organisation to students for existing qualifications or units of competency completed or previously formally recognised at the same or another institution or training organisation does not constitute RPL under the VSL Assistance Scheme. 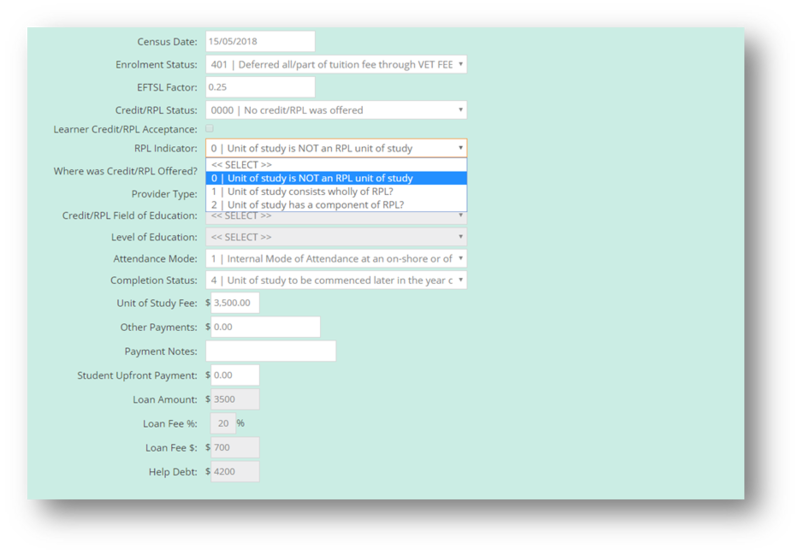 If the tuition fee charged for a unit is purely an RPL assessment fee, this is required to be reported with a value against the RPL indicator. If the unit is fundamentally a teaching unit, the value against the RPL indicator will be zero. Full details of the reporting requirements are covered in the HEIMSHELP coding notes and glossary. The glossary provides an RPL definition (http://heimshelp.education.gov.au/sites/heimshelp/resources/glossary/pages/glossaryterm?title= Recognition of prior learning) as well as a PDF document explaining how RPL should be reported (http://heimshelp.education.gov.au/sites/heimshelp/Resources/Documents/Reporting-RPLDiagram.pdf). Note: The completion status should be set to 5: Recognition of Prior Learning after the RPL process has been finalised. Progression summaries need to be sent to VSL enrolments. These forms needs to be sent throughout the year at four month intervals with dates in February, June (to be July for 2017 only) and October. Refer to the list of VSl /VFH Reports below and follow the steps on How To Generate a Report relevant to your requirements. There are different stages in VSL reporting. If you have a distinct list of learners falling below an average percentage, you can use the following features to send warning letters and messages. This feature is a mixture of generic templates for you to customise and issue in bulk to Learners. It is important to update the outcome against Units of Competency as well as the completion status against Units of Study. 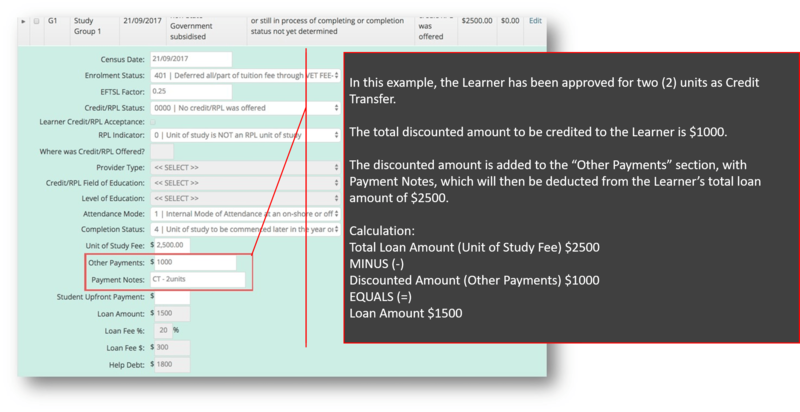 Bulk Update is used to updated multiple fields for One Course Enrolment for a Learner. When a Learner withdraws or completes their enrolment their records need to be finalised.